Many people destined for great lives of exploits live and die as averages; a disappointment to their destiny and the world they were created to impact. Many even fail totally and end up as liabilities to the same world they were designed for as assets. Too often, the blame is laid at the devil’s doorstep. Average lives never take responsibility for their averages; failures hardly acknowledge their pivotal roles in their failings. Somebody must be the cause. We externalize the causes and exonerate ourselves of all faults when things go wrong. However, the truth in life is that we have so much to do with what happens to us. Either by carelessness, laziness or errors of omission or commission, we can hardly honestly wholly blame the devil, his agents or anybody we feel comfortable enough to blame, especially when they are not offered an opportunity of self defence. This book examines how we may be guilty. It x-rays the booby traps and pitfalls we need to watch out for in life as we march towards destiny fulfillment. These pitfalls have no respect for ages or titles. They can undo anybody; young or old, rich or poor; the famous or the unknown. Great marriages have been broken; excellent careers have been truncated; loving homes have become war zones; wonderful businesses have crumbled due to some of these avoidable, but often taken for granted pitfalls. 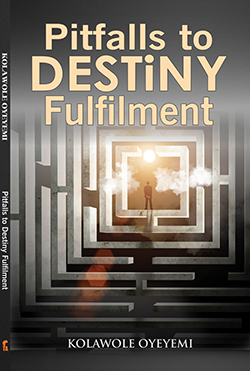 Therefore, a prayerful study of this book will help you locate where you are on your pathway to fulfill your destiny and watch out for those little foxes that can prevent your arrival. May the eyes of your understanding be enlightened as you read and may you walk in the grace that enables men win the race.